Down works as an insulator by trapping air. The more air that is trapped, the greater the loft of the down. It is by this loft that the performance, or quality, of down can be measured. The volume a fixed quantity of down will occupy is commonly referred to as its Fill Power (FP). Most down products are currently rated according to one of two systems, one European (the Lorch Fill Power standard recommended by the Swiss-based International Down and Feather Laboratory) and one American (which has now more or less merged with the International Down and Feather Laboratory standard) . Both systems measure fill power in cubic inches. The two systems use the same basic measuring technique, but yield different results due to variances in the physical parameters of the test equipment itself. In short, the EU test is the nearest metric equivalent to the original US method. The US test gives a number that is 7-8% higher than the EU figure for an identical sample. Any published figures should be qualified by the test method used, but in its (all too frequent) absence, assume it is the US figure. (Brands always like to quote the biggest number they can). Fill-power is expressed in cubic inches (a quaint throwback to imperial days) and the bigger the number, (i.e. larger the volume), the greater the ability to trap air. How good is my down? Down with a fill-power of 800+ is extremely good. Whilst it is possible to get down up to 900 fill power at a commercial level, it is very expensive and availability can be unreliable; 850 is the highest quality that is consistently available. First, a sample of down with 800 fill-power in a 90/10 mix is going to loft exactly the same amount as a sample of 800 fill-power in a 95/5 mix. The ratio is irrelevant as far as lofting ability is concerned. Second, the means of measuring this is itself quite subjective – it is effectively done by a person going through a selected mass of down and separating out the down from feathers, the judgement of which is based purely by eye. There is a lot that falls into a “grey” area. Furthermore, there is no evidence to say that a handful tested from one part of a bale will yield the same results as that from another part. There is a view that the ratio can qualitatively affect the performance. A higher proportion of feather means there is more chance of leakage as the quills can penetrate fabrics more readily. Conversely, there is also a school of thought that maintains 100% down doesn’t last quite as long as a 90/10 mix – in other words, a small amount of feather gives the down “body” and a little more “resilience”. Finally, it stands to reason that the higher the fill power, the more down and less feather there is going to be. Down is recovered from geese all around the world. The best known, “traditional” sources are Poland, Ukraine and Hungary. However, down is recovered commercially across a wide variety of countries, from France right across Europe and Eurasia to Siberia. China has also become a major source in recent times, and there is a healthy industry in Canada. Down is usually purchased from (goose) meat factories and goose farms by middlemen known as consolidators. The consolidators – companies such as Allied Feather & Down and Down Décor – then take responsibility for cleaning, sorting and grading the down for resale to manufacturers of bedding and clothing. Thus, when purchasing down from a consolidator, the original source of the down (and thus ethical integrity of farming and recovery practices) has long been forgotten. Recently, pressure from animal rights groups have resulted in the consolidators offering premium down qualities that can be traced back to their original source. Down comes from domestic birds (wild birds have down too, of course, but this is far more difficult to collect!). Domestic birds – chicken, turkeys, ducks, geese – are available all around the world, and the collection of down is practiced everywhere. To obtain a fill power of 500 or above, it is widely acknowledged that the best source of down is waterfowl – ducks or geese. The common view is that goose down is best. In fact, at the lower end of the fill-power spectrum, e.g. at 600 FP, there is no difference between duck down and goose down. A duck down with a fill power above 750 is rare, however, and it is here that goose down truly comes into its own. For high-performance sleeping bags with fill powers greater than 750, the source of down will inevitably be geese. Fill power can be highly variable even in the case of goose down, however. Environment and the age of the bird are two major determining factors in this respect. It is widely believed that the colder the climate, the better the quality of the down. This may be true, but it remains to be definitively proven and it certainly does not mean that high-quality down is not available from warmer climates – because it is. The age of the bird is very important. Since down collection is usually a by-product of the meat industry, most down comes from (increasingly) young birds. However, the very best down – i.e. with a fill power of 750 or more – comes from mature birds, which have larger down clusters and more of them. As Poland has a large-scale goose-breeding program for the production of meat, and thus a large number of mature female geese for laying eggs, it has by accident created a source for very high quality down. These breeding geese can be “harvested” (brushed) for the large down clusters found on them – a process that is done at approximately 6 week intervals, and only for six months of the year when they are not breeding (geese are fairly unfriendly as it is, and are completely unapproachable when they have goslings). 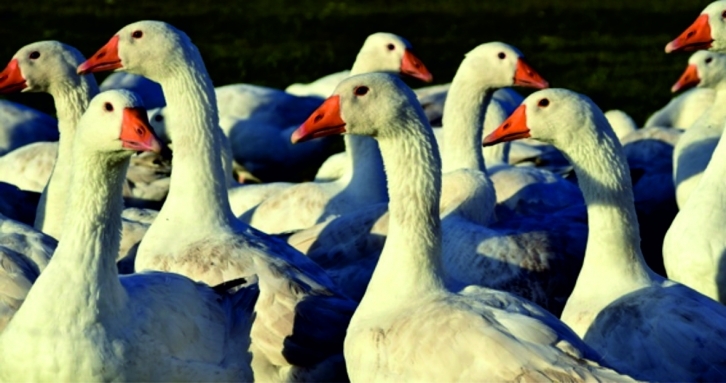 Consequently, Poland has become recognised as the source of the best goose down in the world.